Feed your joints the nutrition they crave. CellRenew 2000 Collagen Type II What is CellRenew? Who is a Good Candidate for CellRenew? 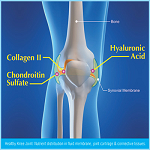 Collagen Type II (CTII) has been suggested to offer significant benefits for some types of arthritis. The word ‘arthritis’ is Latin, from Greek ‘arthro’ (joint) and ‘itis’ (inflammation). This very broad definition covers a lot of ailments, but says nothing about the causes. The forms of arthritis that most of us are familiar with are osteoarthritis and rheumatoid arthritis.Osteoarthritis is usually caused by over-use, abuse, and injury. It is by far the most common form of arthritis. It is known that merely the aging process, and so many years of gravity working on the weight-bearing joints, is a major contributor to this type of arthritis. Osteoarthritis is not considered an autoimmune disorder (like rheumatoid arthritis) in which the body attacks itself as it would a foreign invader. For those suffering from osteoarthritis, CTII provides the critical building blocks that restore a healthy state to the cartilage in the joints. 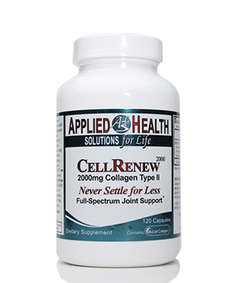 CellRenew is made from chicken sternal cartilage that contains the highest level of naturally occurring anti-inflammatory proteoglycans (Hyaluronic Acid and Chondroitin Sulfate A) of any other material tested, including shark cartilage. 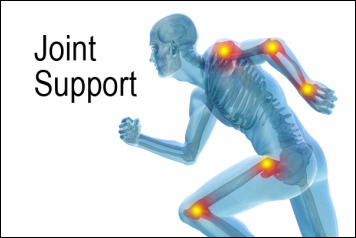 It is important to note that the combination of the proteoglycans and the Collagen Type II proteins not only protect the cartilage, but also provide the building blocks required to rebuild lost cartilage to restore the joint to a normal state. Although some people have noticed an improvement with their symptoms after only a week or two of starting a CellRenew program, many take between 4 and 6 weeks. We urge you not to get impatient with your progress. A recent clinical trial reports an 89.9% response within 45 days. Remember that these are natural based, non-toxic, core nutritionals that are not designed to just cover up symptoms. Instead they are designed to correct a problem that has often been present and ignored for many years. In most cases it took many years to get to a state of particular complaint, and rarely are root causes improved on overnight. With that said, however, we have noticed that some forms of arthritis symptoms tend to respond faster – on average – than other forms. For instance, we do know that rheumatoid arthritis sufferers have a tendency to respond faster, and curiously, people who have spinal discomforts notice improvement typically in less time than someone with discomfort in one of their weight bearing joints (knees, hips). We suspect this is more an issue of the weight bearing joints needing to develop a much greater degree of damage prior to showing symptoms than perhaps is required for a spinal condition. A: Collagen Types I, II, and III make up the greatest percentage of collagen proteins in our bodies. A: Collagen Type II is the most vital type of collagen for healthy joints. It is very high concentration in the cartilage, which provides the slippery cushion on which the moving parts ride. Every serving of CellRenew Hydrolyzed Collagen Type II includes 200 milligrams of Hyaluronic Acid. It is rare to discuss arthritis, without discussing the knees.This is because, as a weight-bearing joint, and due to the knee’s complicated structure, they are the most susceptible to wear, overuse, abuse and trauma due to an active lifestyle. CellRenew… It’s like meeting your “Bends” best friend.